If you have any questions or want to enquire about dates, use our form to contact Sally Harrington or see their website for more information. The views across the Wealds are stunning! These former farm buildings have been renovated with flair, and Sally has created a gorgeous, comfortable home. Unhurried, very good breakfasts are eaten in the huge kitchen by the jaunty lemon Aga, and floor to ceiling glass doors open on to a wooden deck; spill outside on warm days. After a hearty walk you can doze in front of a tree-devouring inglenook. Find lovely sunny bedrooms with more of that view from each, natural colours, tip-top mattresses and the crispest white linen – chocolates too; bathrooms have travertine marble and underfloor heating. Friendly, spoiling and completely peaceful. Stayed in this Bed and breakfast, the host of this Bed and breakfast is wonderful and so welcoming, the house is lovely and the beds are so comfy, the breakfast was delicious. I can’t recommend this place enough, book here, you won’t regret it! Thank you Sally, Simon, Crystal and Ruby for making us feel so welcome during our two night stay, and for looking after us so well. We stayed here through a friend's very high recommendation. We had such a fabulous time! The grounds and views are breathtaking and the house is superb....so incredibly stylish and arty! All of the rooms are immaculately presented. The cooked and continental breakfasts are wonderful, and plentiful! An ideal location to explore Rye, Camber Sands, and the wonderfully picturesque countryside. We will definitely return one day! Well - I think the other reviews have already said all that I wanted to say. I could not imagine a more perfect home to stay in this beautiful part of the country. Sally and Simon really were perfect hosts and the bedrooms, bathrooms, toiletries, gorgeous kitchen, lounge, fabulous outside decking area, superb breakfasts, welcome tea and cake were all absolutely spot on. My friend and I wanted to move in and never leave but I don't think Sally was keen on that! We are already working out when we can come back. I can't recommend this wonderful place enough. 4 blissful days. Thank you Alastair Sawday for finding this little piece of heaven on earth. Sally and Simon are the perfect hosts and nothing was too much trouble for them. Everything was wonderful - the company, the house, the garden, the surrounding countryside. We cannot wait. to return. What a lovely relaxing place to stay. Beautiful home with a beautiful view from the breakfast table which was a highlight of the day along with the breakfast itself, which was of the highest quality with a great variety of food from which to choose. Sally and Simon were perfect hosts making us feel completely at home from start to finish. We shall certainly go again. We came to visit the locality, but almost didn't want to leave such a beautiful and interesting house and garden. Sally and Simon looked after us superbly, recommending restaurants and pubs and giving good advice on our days out. These began in a south facing kitchen looking out onto magnificent panoramic views. Delicious breakfast from the aga with a variety of fruits and cereals was a perfect start to a day which finished late evening relaxing in the very English garden wrapped in pashminas thoughtfully brought out by Sally. Everything is of the highest quality, including the hosts! I spent an amazing long weekend which started the moment I arrived with a pot of tea and cake . The house is very charming set in beautiful Kent countryside which i enjoyed while tucking into a hearty breakfast. Sally and Simon made me feel very much at home. Nothing is to much trouble. I am hoping to return with my husband . We landed in Ramsden Farm by chance 7 years ago... Since then, we have stop counting how many times we came back. We visit in all 4 seasons and not once have we felt it was a wrong choice. Sally and Simon are master in hosting and making sure their guests feel comfortable, welcome, entertain and above all, special. The view from the kitchen is exceptional and so is the breakfast! In winter, the main room with its open fire invites you to be lazy and relax. We just try to not recommend the place too much, to make sure we always have a room! One of Sawday's best! The hosts are so friendly, helpful and welcoming. Accommodation is immaculate in beautiful rural location with far reaching views. 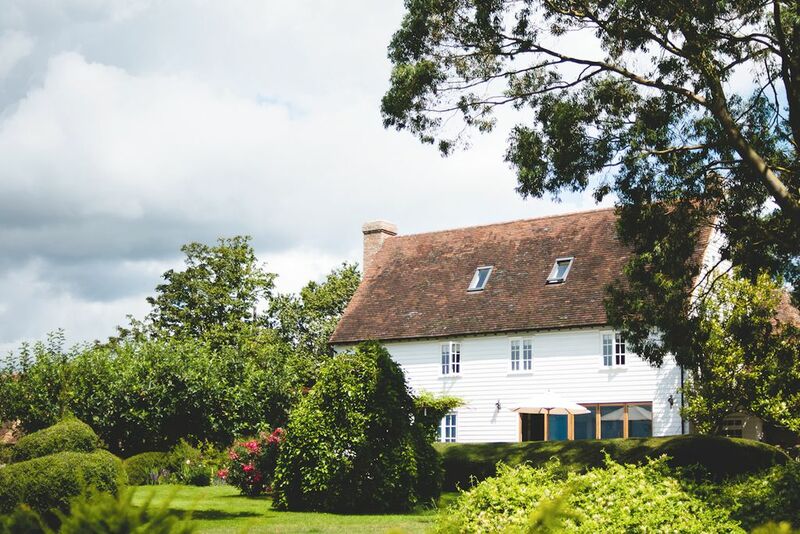 We awoke to hear a cuckoo calling and spotted three deer in an adjacent field before being treated to a delicious breakfast in the spacious airy kitchen looking out across the lovely garden to the Weald. Highly recommended. Sally is a delightful host - funny, warm, caring - full of life and anecdotes. Sally's house is that perfect mix of comfort, quirky artistic style and clever, well thought out design. Everything is the finest quality and the best taste. Sally has a skill for turning her environment into a happy and beautiful space which she is happy to share. She is also very sensitive and intuitive so is able to treat all guests as unique and special, giving them her full attention, yet space and quietness too. We slept so well, and breakfasts were delicious - especially Sally's homemade marmalade! Sally and Simon epitomise the very best of English B&B hosts. Living in a superb farmhouse set in a wonderful location. Nothing is too much trouble - every want is anticipated. We shall be going back for more - thats for sure. We have no hesitation in giving this luxury accommodation our full and unqualified recommendation. An excellent stay in a beautiful home, filled with interesting artwork and quirky objets. Sally made us most welcome and accommodated all six of us comfortably, seating us by a roaring fire on cold, stormy nights and, when the sun finally appeared, opening wide the magnificent bi-fold doors to access the stunning verandah. With the addition of the usual high Sawday standards of comfort this was a great stay surrounded by the delightful Kent countryside. We have just returned from a fantastic weekend at ramsden farm. Sally is a wonderful host and her home is everything you could could wish for in a B&B. It really is a great place to stay. Gem of a B&B, our own idea of paradise. Amazing house with lots of interesting nooks and crannies, intriguing art work and a lovely garden and terrace with a fabulous view over the Kentish countryside. Rooms are beautifully furnished with little extras, like fresh flowers lovingly added. On arrival, Sally greeted us with tea and the most delicious freshly-baked cake. We could not imagine a warmer welcome. Breakfast is a sumptuous affair. Sally is a most gregarious host, nothing is too much to ask, she even helped us making dinner reservations. We loved it and will definitely be back! Wow! What a stunning house & location not to mention the warmest of welcomes from Sally. Tea and cake on the decking on arrival overlooking the stunning Kent Countryside. Rooms are tastefully decorated and spotlessly clean. Freshly cut flowers in our room and attention to detail everywhere. Breakfast was delicious with a huge choice. The house was beautiful but Sally's hospitality made our weekend extra special & one we won't forget in a hurry. Oh & hot air balloons drifting over in the evening whilst being made very welcome to enjoy Sally's garden with our wine. Will be coming back for sure! Sally is a great b&b host.She welcomed us with a smile and tea and cake in her lovely kitchen. Our breakfasts were well prepared on the yellow Aga and we enjoyed dining in the spacious kitchen overlooking the garden and countryside. Ramsden Farm is spacious and our room was comfortable and tastefully decorated. Nice little touches were chocolate biscuits on the tea tray,fresh flowers ,and a chocolate! Ideally placed to visit gardens and vineyards. We will return and enjoyed our stay very much. I and my 2 daughters and 3 bridesmaids spent 2 nights at Ramsden farmhouse during my daughters wedding weekend, I can honestly say Sally made everything perfect for us, nothing was too much trouble, the rooms and breakfast are absolutely fantastic, tip top standard.All of us could not recommend it more highly. We so enjoyed our stay in this immaculate and luxurious accomodation. We felt welcomed and fussed over. It will be worth a stay just to experience the breakfast. You must see the ensuite wow what a wash basin luxury gone wild. We did consider stealing the bed because it was sooooo comfortable. Kent countryside at its silent best. Don't take our word for it go and see for yourself. Love Gardens? We are surrounded by them. The world famous Sissinghurst Castle Gardens of Vita Sackville West fame is only 3 miles away & Great Dixter, the family home of gardener and gardening writer Christopher Lloyd is 7 miles away. Love food? The West House in Biddenden is a Michelin Star restaurant 10 minutes away. Kent is known as the Garden of England with good reason, and here in the most picturesque of locations sits a restaurant which celebrates the region’s prime terroir. Miles of sandy beaches at Camber Sands - only 35 minutes away. Ancient smugglers' haunt of Rye, with its harbour and winding cobbled streets, is 30 minutes away. Take a step back at time and ride on the steam railway at Tenterden - 3 miles. Or visit the famous Pantiles of Royal Tunbridge Wells are 35 minutes away. I have a self-catering in cottage that sleeps 6 if you have a large party that you want to accommodate.